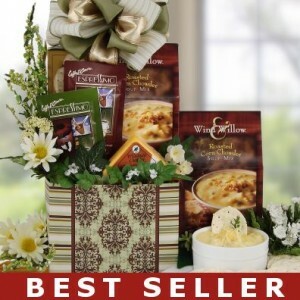 Gourmet Soup Gift Baskets Ease Those Achoos Away! It’s that time of year again. You’re planning out your Thanksgiving menu, whipping up those deliciously cheesy mashed potatoes, fluffing up the pillows in your guest bedroom, and…battling a case of the sniffles. First – Happy Thanksgiving from all of us at BisketBaskets.com! We’re so thankful to be in business for over 11 years strong, and we owe it all to our wonderful fans! Now let’s get to the cold part. It’s never fun to have a cold, especially during the holidays. We’re based in Parker, Colorado, so we know a thing or two about how the cold, and stress of the holidays, can wreak havoc on your body. Here’s our BisketBaskets.com approved tips on fighting off that cold! Vitamin C is Key: Vitamin C is important year round, but especially when you have a cold. Most people can only absorb about 250 to 500 mg a day, so be sure you’re taking adequate doses of Vitamin C when you’re sick, and continuing to throughout the year. Sleep On It: Let’s face it, you’re busy trying to do all you possibly can during the holidays, resulting in less sleep than usual. You can’t turn back time when you’re sick, but you can rest and get some sleep now that you are sick. Do your best to always get about seven hours of sleep each night, and more when you have a cold. Soothing Soups: Can chicken soup cure the common cold? Not exactly, but it sure can make you feel a lot better. Send a smile to a cold-stricken special someone in your life by surprising them with a Gourmet Soup Gift Basket, like our Comfort Soups Gift Basket, Country Christmas Soup Gift Basket, and our Soups On! Gift Basket. Soup gift baskets just seem to have that special dash of joy and happiness, just what you need when faced with a runny nose! Call In Sick: Sure, calling in sick is a lot more fun when you’re not actually sick, but it’s important to dedicate yourself to getting better when you’re sick. By staying home from work, you’re decreasing the length of your cold, and also keeping your co-workers from getting sick. We give you full permission to spend the entire day on the couch watching talk shows and soap operas! We hope you have a healthy holiday season free of colds, but if you do start coughing, you know just what to do! Consider Soup Gift Baskets your ticket to battling the achoos! Having A Dog Question? Ask OurDogBlog.com! We’re all about dogs here at BisketBaskets – they’re our best four-legged friends, and we just couldn’t imagine growing up without dogs in our lives! We recently came across Our Dog Blog, where dog owners can ask questions and post answers to common questions to help out the dog community on all those canine questions bubbling up in your mind! We actually posted our own question and answer at “What Should I Know Before Adopting A Dog From A Shelter?” based on our tried and true experience. We hope you’ll head on over to OurDogBlog.com and help out by asking a question or posing your own question and answer! I will always remember one of my favorite weekends of the holiday season as a child. I would wake up to the smell of delightful sugar cookies and scrumptious peanut butter cookies tickling my senses, the whirl of the mixer whipping up that wonderful cookie batter, and the lively chatter of my Mom, Grandma, and Aunts as they ticked recipe after recipe off their Christmas cookie list. As I got a bit older and learned just how important it is to know the difference between a teaspoon and a tablespoon, I was able to bake right alongside the women of my family. Today, I’ve kept the tradition very much alive with my own family, with just one much-needed change: the men are helping out now, too! It’s always interesting to learn just where those old family traditions come from. Would you believe that Dutch and German settlers actually introduced cookie cutters and cookie molds – and am I glad they did! Sugar cookies, one of my favorite Christmas cookies, are descended from English traditions. In fact, Christmas cookies have been around since the 1500s, with Germans favoring gingerbread and lemon Spritz cookies; Swedes in adoration over ginger and black pepper cookies; and Norwegians whipping up lemon and cardamom-scented wafers. There’s quite a variety of Christmas cookies today, with tons of different flavors, shapes, and icing ideas available at your fingertips! Families are much more busy these days, making it difficult to find a spare weekend to create those scrumptious cookies, but it’s of course important to keep such a rich family tradition alive. We’re always trying to find ways to make your life a little simpler here at BisketBaskets.com, and we’ve partnered with a favorite bakery of ours to create Christmas Cookie Baskets, including Winter Wishes Cookie Bouquet, our super cute Sweet Snowman Cookie Bouquet, and our pretty Deck The Halls Christmas Cookie Basket filled with only the most out-of-this-world cookies that not only taste delectable, but look it, too! Holiday-themed icing designs adorn the top of each cookie, allowing you to give out Christmas cookie baskets that have quite the “wow” factor. Plus, you’re still keeping up a time-honored tradition, with just a dash of newness added! It’s that time of year again when we get to realize our dreams come true. No we didn’t win the lottery, become Queen of a beautiful tropical island and that was totally a dream where George Clooney asked you to marry him! We get to sleep in without hitting the snooze button for a full hour! It all comes to an end at 2:00 AM on Sunday, November 7th 2010 and we move our clocks back and get to experience a one-time, one hour Groundhog Day just like in the movies! You can relive that hour, you can do it once; then do it all over again just for fun but most of us will sleep right through it and just enjoy the extra hour of sleep come morning. On this unique day every year we are reminded not only to move our clocks back one hour but to also replace the batteries in our smoke detectors, change the baking soda in your fridge and start to think about the upcoming holiday season. Okay, so perhaps I just tossed that one in there but the truth is… you should be! Christmas is only a mere … 49 days away and counting and if you count the holiday gifting season, that starts in only 23 days. BisketBaskets.com has been designing holiday gift baskets for 11 years and we are confident we can provide just the perfect gift for your loved one or corporate clients. We are taking corporate holiday orders already so if you’re ready to discuss holiday gifting please email us (info at BisketBaskets dot com) and we will set up a time to discuss your business needs. If you wish to shop early for your personal and corporate holiday gifts, we do offer the buy now/ship later option on our website. Let us know if we can be of service to you this holiday season.